looks like I caught you in the nick of time. Was he bothering you Dollface, this galactic nerd? I'll blast him into spacedust, just say the word." have another drink dear, this one's on me." "Whoa Buddy, is this your girl? I've been away on the planet of Zurl. CAREFUL with that thing, it might go off! Last I knew you were married to Gloff." pickled in a jar with a galactic view." if he wasn't a rat, he'd just be a bum." "So come on Buddy, what do you say? Can we forget what happened here today? live and let live, the nights' just begun!" I'll blast you to spacedust if you cross that line. then take it outside, because Dollface is free! 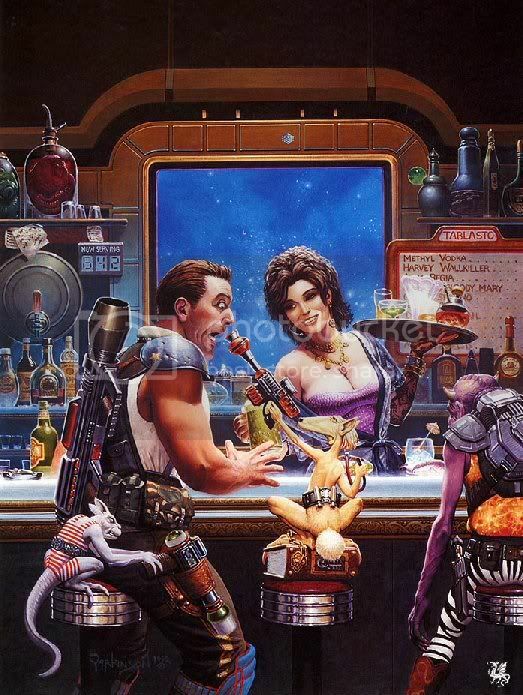 Staring down the muzzle of a space gun held by a rat sitting at a bar on a book. This has got to be the funniest thing I've seen in years. The story line is priceless. I've got a short trip tonight, only about 300 miles, but I'm going to either be laughing or smiling the whole time. Stop looking at the light. Instead, look at what is being illuminated by the light. ...for some reason that just cracked me up. Very funny interpretation of the pic, Marsha.